Heritage Open Day, the one day of the year free entry to Lincoln Cathedral, unless of course attend a service. Rather than walk up the High Street, up The Strait, up Steep Hill, I took a different route. Along Sincil Street (sadly trashed by the local Council in cahoots with the local Coop), over the River Witham, up past The Collection, then Well Lane which brings out on Steep Hill a little past Base Camp. To my pleasant surprise, a farmers market in Castle Hill, held the third Saturday of the month. Spending time on the market meant I had very little time to wander around Lincoln Cathedral. I noticed seats laid out, each labelled. Front row, County Council chief executive, chairman, and other County Council jobsworth, then rows Lincoln City Council, then RAF, then cadets, and almost as an afterthought, a few seats for the public. I asked. A Battle of Britain Commemorative Service 3 pm on Sunday. Where then the seats for Veterans? And was the priority not wrong? Should not the worthless parasites be at the back, Veterans on the front row, followed by RAF? Inquiries were made. Veterans were not even aware of the Service. Did not get into Lincoln until late afternoon. Sun dropping, and temperature dropping by the minute. With cold wind blowing, frozen to the bone within minutes. Although before four o’clock, most of the shops in Sincil Street closed or closing. Cappuccino in Stokes on High Bridge. Road works meant amended bus timetable, buses to Washingborough running every half an hour not every twenty minutes xx10 and xx40. Walking up the Strait and Steep Hill, very misty, very atmospheric, the stuff of a Victorian melodrama, which explains why many such dramas have been filmed here. The towers of Lincoln Cathedral were shrouded in mist, as was the entrance and walls of Lincoln Castle. Westgate, which follows the walls of the castle, freezing cold fog. Walking back down, the sun came out for a brief period, but not for long, back came the mist. Around the back of Lincoln Cathedral (where can be found flying buttresses and Alfred Lord Tennyson) is the entrance to the tea shop. It can also be accessed if already in the Cathedral from the cloisters. This is quite a charming little tea shop, and apart from sticking my head in following a silent meditation at Mary Magdalene during the Winter Solstice, I have not visited this tea shop for years. I had tea, and what I thought was carrot cake, but as it tasted of ginger could not be sure what it was. I do not think it was freshly made, probably bought in factory cake, and nowhere compared with the excellent carrot cake from Café Mila in Godalming. A door leads out of the tea shop and into the cloisters. A pity they have now placed tables and chairs in the cloisters as it completely ruins the cloisters. Winter is not the best time to view the cloisters. Summer is best, when the sun catches the limestone and gives it a warm glow. In the winter the stones look cold. A pair of Peregrine falcons have taken up residence in the towers (to them it resembles a cliff face). One would expect it to keep down the population of pigeons, but according to the staff, not so, and they have been seen hunting as far afield as woods in North Hykeham. The tea and coffee are fair trade. The coffee is supplied by Stokes. I am the magnetic force of the universal presence and the ceaseless ripple of its smile. Today was the shortest day. At a little wholefood stall in at the Central Market in Lincoln, maybe a new stall as I have never seen before, a little typewritten notice of celebrations for the Winter Solstice. 1100 Mary Magdalene Church, Castle Square, Lincoln for a silent meditation at 1111. 1130 Tea shop at Lincoln Cathedral. 1530 Heartwood near Branston to observe the sunset. The only one I was able to make was the silent meditation at Mary Magdalene. Walk to the top of the High Street, then up The Strait and Steep Hill. I must be unfit as hard going. Mary Magdalene is rarely open, it was a pleasant surprise to find open. No mention of mediation, no one knew what I was talking about. Rather annoying, very noisy people in the church. Unbeknown to the church the silent mediation did take place, and luckily the noisy people had left. But why can people not be quiet in a church? In the main Catholic Church in Puerto de la Cruz, it is always quiet, those in the church are either silent or converse in quiet whisper. Silent meditation in a church, one very quickly becomes aware of surroundings, every little sound. Nine people turned up, ten counting me. I like this idea a group of people unannounced descending on a church. I walked with them to Lincoln Cathedral. I was curious why these two locations? Mary Magdalene represents the sacred feminine, Lincoln Cathedral masculine (I assume St Hugh), yin and yang. Mary Magdalene lies immediately outside Lincoln Cathedral. At Winchester there is a little church immediately outside the cathedral. Mary Magdalene, an old Saxon church, lies on a ley line (I do not know what evidence). It is also at the junction of two Roman roads. One I know to be Ermine Street, I assume the other to be Fossway. A little south of Lincoln, where you can still walk on the old Ermine Street, not a modern road that follows the route, is an ancient Templar building. At least one of the group of nine had read The Alchemist several times (the tenth anniversary edition is currently available as e-book reduced price). I said there was a new book, Manuscript Found in Accra available next year, Aleph was in The Works at a low price, The Pilgrimage preceded The Alchemist, and to check out The Alchemist pen from Montegrappa. And do not forget audio book of The Way of the Bow is free! Today the world was going to end (the day has not yet ended). A misinterpretation of what Mayans predicted. They predicted a new era of understanding, not the end of the world. (14th Baktun). The River Witham, High Bridge, The Stonebow, a couple of old churches, Sincil Street the only area of character left around the old market area, and that is about it, little else of interest in the city centre of Lincoln. The same trash High Street stores as in every other town across the country. Clone town writ large! For more interesting part of town, walk through The Stonebow to the top of the High Street. At the top of the Hight Street, The Strait, which leads into Steep Hill. Both have buildings of character, quirky buildings, quirky independent shops, even a lampost leaning over. On the left as you walk up The Strait, two Norman House, one of which houses an excellent restaurant. As you climb up Steep Hill and it earns its name, your are following the main Roman Street that ran through the Roman city of Lindum Colonia, up from the River Witham to the top of the hill. More Norman houses as you walk up Steep Hill. A tea shop, selling teas not cups of tea, though you will find those too, dress shops, a chocolate shop, a flower shop, art galleries, second-hand bookshops, little bars and restaurants, a pie shop, a clock shop (though rarely open). Even a Russian doll shop! On the way up, occasional glimpses of Lincoln Cathedral. As you pause for breath, look back and you will see across the valley to South Common on the opposite escarpment. Once the top is reached, and take all day as there is much to tarry for and no need to hurry, you will find yourself in Castle Square. To the left Lincoln Castle and to the right Lincoln Cathedral. Carry on and you are in Bailgate. As you enter Bailgate, a little church on the right, worth gaining entry to, though rarely open. In Bailgate a small butcher. If not the best in Lincoln, maybe even the County. Walk around the castle to The Lawn, which Lincoln City Council in an act of crass stupidity has put up for sale. The Lawn, a former pioneering Victorian Mental Hospital houses the Sir Joseph Banks Conservatory. Sir Joseph Banks was the Chief Scientific Officer on the Endeavour. I have a knack of being in the right place at the right time. I had been in The Collection far longer than I wished due to it raining. It finally stopped, giving me time to walk up Steep Hill and back down, but little more. Looking down Steep Hill the winter midday sun caught the buildings and the wet street. A week later and half an hour later, the sun did not catch the buildings or shine down the street. Half an hour made all the difference. At the top of Steep Hill is a little bronze plaque saying it was awarded Britain’s Best Place by the Academy of Urbanism. Steep Hill must have the rare accolade of a street being reviewed on Trip Advisor! It is a rare experience to be able to walk the length of a street in England and not encounter a single High Street chain store. This is how our towns used to be until destroyed by greedy developers and corrupt planners. Top Story The Digital Mission Daily (Monday 30 January 2012). Lincoln Cathedral sits atop of a hill. It is visible from miles around, but within the city not so as the short-sighted Lincoln City Council has allowed the erection of appalling multi-story eyesores. The same city council that has presided over destruction of the heart of the city, has put the historic Lawn up for sale and now plans the destruction of Sincil Street, the one area of character left in the city centre. It used to be policy to not allow any building to obstruct the historic skyline, but now greed and fast bucks is all that matters. The best way to approach the Cathedral is on foot. From the top of the High Street, up The Strait, passed Norman Houses, up Steep Hill and more Norman Houses, and the cathedral is there when you reach the top. On the way up you will get tantalising glimpses of the cathedral. Resist the temptation to tarry, if you do, you will not have time to look around Lincoln Cathedral. Though there is lots to see on the way up. If you do tarry, then make the most of it and save the cathedral for another day. I did tarry, with the result that on the two days I made it to Lincoln Cathedral, before Christmas and in the New Year, I had no time other than to look in the door, have a chat with the Duty Chaplain and light candles. Lincoln Cathedral was founded by the Normans not long after they invaded, as was Lincoln Castle. It is the finest Gothic Cathedral in Europe, as you will see when you step through the door and look down the nave. The view down the nave literally takes the breath away. Worth the climb if you only look down the nave then have to turn around and set off back down the hill. As did I. Inside the Cathedral the Lincoln Imp, Cathedral treasures and lovely cloisters that are very tranquil to walk around. 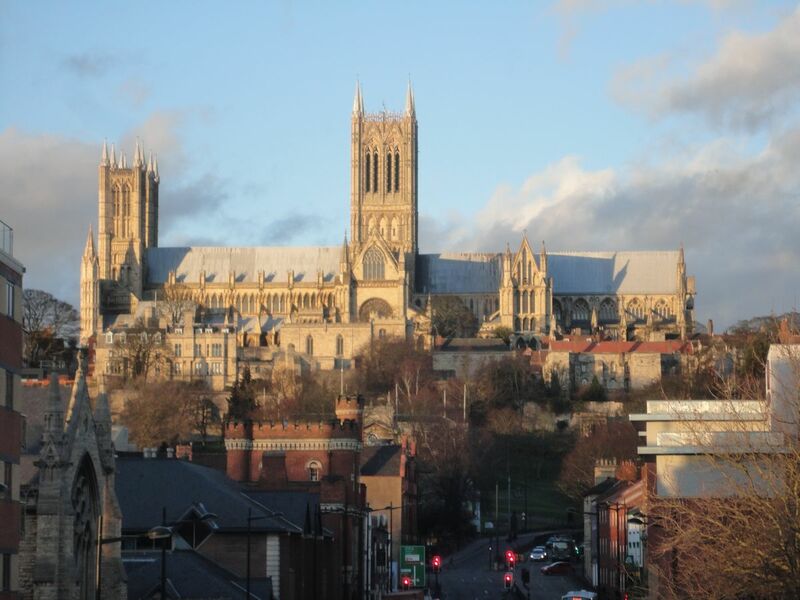 Lincoln Cathedral owns one of the four surviving copies of the Magna Carta, currently on loan to Lincoln Castle. Lincoln Cathedral was used as the set for The Da Vinci Code, with Tom Hanks staying at the nearby White Hart. I have a knack of being in the right place at the right time. The light on the walls is the winter sun filtering through the stained glass windows at midday. The cathedral on the hill is the cathedral being caught by the morning sun not long after sunrise. But note the ugly building on the left, a blot on the landscape. Candles in the side chapel are a bit of a disappointment. A sand pit! I would have at the very least expected wrought iron candle holders. The book to get on Lincoln cathedral is Capturing Lincoln Cathedral, though you will have a job as it was a limited edition edition and I picked up the only two remaining copies. It captures the cathdral in all its moods. Today three candles lit in Lincoln Cathedral: One for my lovely but sadly mad friend Sian, one for Paulo Coelho as thanks for writing Aleph, and one for Canon Andrew White who was back from Iraq. Contrary to the lies from Barack Obama, Iraq has not been left in a stable state. Iraq descends into hell. On the climb up to Lincoln Cathedral I passed a Russian doll shop and stumbled upon a Roman well. This wonderful almost life-size nativity scene can be found just inside the main door of Lincoln Cathedral. Handel’s Hallelujah Chorus sends shivers down the spine! I want one day to see Handel’s Hallelujah Chorus performed in Lincoln Cathedral. When Handel wrote Messiah, he thought he was being inspired by angels. When Ernest Shackleton went on his doomed polar expedition to Antarctic he took with him Leonard Hussey, a meteorologist and banjo player. The ship became trapped in pack ice and was slowly crushed and sank. Shackleton allowed every man of the crew to take with him off the ship 2lbs in weight of personal possessions. When we hear Handel’s Hallelujah Chorus we understand what he meant by ‘vital mental medicine’. Leonard Hussey survived, as did his banjo. It is now in the National Maritime Museum in Falmouth, its skin marked with a dozen signatures of members of the failed Shackleton expedition to the South Pole.